With university tuition fees being at an all-time high and the rising costs of student accommodation, more young people than ever before are weighing up their best routes into a career. Given that the average undergraduate leaves their three year programme with a debt of approximately £50,000, many are questioning whether a degree is still worth the investment? It’s not surprising then that concerns about student debt along with the Government’s drive to significantly increase the number of Apprenticeships is having an impact on the career choices made by young people. And the result is that more and more are now choosing Apprenticeships over university to access their dream job. Apprentices can earn anywhere from £22,644 to well over £50,000 in the three years it takes to graduate. At the same time as gaining a degree or professional qualification, they can get a foot on the career ladder. Recent data captured by RateMyApprenticeship shows a two thirds increase over five years in those citing Apprenticeships as a valid career path, a strong indication to employers that this way of learning is a valuable investment for attracting the best talent. The research also revealed a decline in apprentices doing ‘admin’ tasks and focusing on more meaningful work suggesting that companies are now seeing Apprenticeships as a more credible future talent pipeline. Apprenticeships are far more than just a qualification and it is important when weighing up future study options to take into account all the other aspects of the programme around behaviours, learning to be part of an organisation and developing ‘soft’ skills. In fact, it is these aspects of Apprenticeship schemes that employers find most useful when hiring. According to a study commissioned by the Association of Accounting Technicians conducted among 1000 organisations, nearly half of employers (49%) surveyed said they would prefer to see experience from a relevant Apprenticeship or previous position on a candidate’s CV compared to only 24% who would prefer a related degree. When asked why, 71% said it was because apprentices had demonstrated their skills in a practical setting and 62% replied that it showed they had a better understanding of the workplace. With more Government funding going into Apprenticeships, it makes sense for HR teams to take advantage of this apparent disillusionment with degrees by encouraging their organisations to offer new training schemes of their own. For large companies with a salary bill of over £3million already paying a 0.5% levy to help fund new Apprenticeships, it is particularly advantageous. You are already paying, so why not use this pot of money to develop your most valuable asset – your workforce? It is important to note that Apprenticeships are not just for school leavers and young people. There are literally hundreds of Apprenticeships available for any business and people of all ages can apply. In fact, almost every job role now has an Apprenticeship standard attached to it. The good news for HR professionals is that you can use the funding to upskill current staff as well as recruit new talent. Apprenticeships really are more about people having the level of investment in their skills to make them the best they can be in their roles at work. 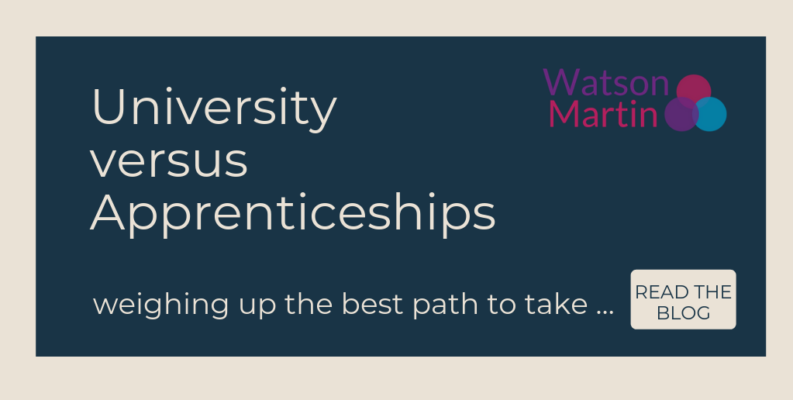 As a RoATP main provider, Watson Martin is already delivering Levels 3 and 5 HR Apprenticeship programmes to cohorts from levy paying organisations. We have also joined forces with other approved training providers which have a track record of delivering Apprenticeship programmes but are not approved CIPD centres. Our Apprenticeship schemes are completely flexible and we believe the organisations we work with have the best of both worlds – a trusted learning partner with years of experience of delivering CIPD HR and L&D qualifications, combined with the expertise to develop an Apprenticeship strategy which is tailored to your company’s needs. With rising fears of a post-Brexit skills shortage combined with a generation of learners who are choosing not to enter university, it is businesses that act now to attract new talent to their companies that will reap the benefits in the future.